The fun of cameras--for everyone. The dream entrusted to the mirrorless EOS Kiss. Canon launched the first EOS Kiss*1 camera in 1993. Back in those days, bulky, heavy single-lens reflex (SLR) cameras were still considered to be hobby items chiefly in the domain of male photography enthusiasts. However, the EOS Kiss made an impressive debut under the concepts of “Compact and Lightweight,” “Ease of Use” and “High image quality.” It helped create a new class of SLR camera users primarily consisting of female photographers, including mothers. 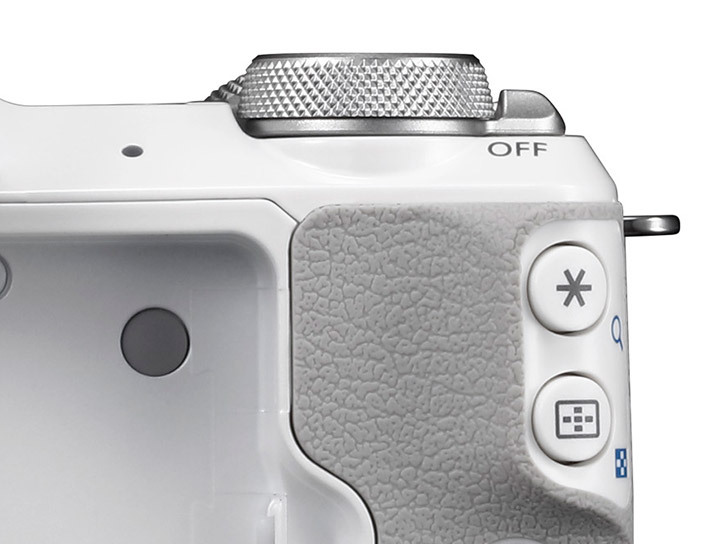 As a result, the EOS Kiss brand became a household name for entry-level cameras. Ten years later, the EOS Kiss was digitalized in line with the changing times. Signature Canon technology such as its CMOS sensors and the DIGIC image processors went a long way towards realizing “Speed, Comfort and High Image Quality” ?-the basic concepts of the EOS series-?while preserving the distinct identity of the Kiss brand, encouraging the spread of digital SLR cameras. With the growth of smartphones, it is now commonplace for people to take pictures of such everyday subjects as food and share them with friends or on social media. Amidst this trend, mirrorless cameras are also rapidly gaining in popularity. And in 2018, the 25th anniversary of the EOS Kiss series, Canon launched the “EOS Kiss M*2,” the first mirrorless camera bearing the EOS Kiss brand name. Despite being an entry-level camera, EOS Kiss M also supports full-fledged photography thanks to its high-speed, high-precision autofocus (AF), high image quality and 4K video recording. What thoughts and feelings did the developers have as they set out to create the EOS Kiss brand’s first mirrorless camera? We spoke with developers from Canon's Product Planning, Image Processor, AF, Image Processing and Product Design divisions to find out. *2 "EOS Kiss M" is the product name used in the Japanese market, outside of which is referred to as the "EOS M50." In charge of film SLR cameras, compact cameras, digital SLR cameras and mirrorless cameras. Motto: Value human relationships and the opinions of others. What was concept behind this camera? Masayuki KatoThe EOS Kiss M was conceieved as an entry-level interchangeable-lens (ILC) camera that allows users who have thus far only taken photos with smartphones to experience the benefits of an ILC system--namely, the ability to easily capture photos with pleasing background blur (bokeh), or capture fast-moving subjects or subjects in low-light environments. In order to attract users unaccustomed to ILC cameras, it was essential to remove any hurdles-?size, weight, difficulty to operate and price-?one by one. Size and weight could be mitigated by making the camera mirrorless. The next challenges were how to incorporate functions that would make the camera easy to use, and how to achieve all this at a reasonable price point. We began the development process with these goals in mind. At the same time, we also felt it necessary to ensure that photos taken with the camera could be easily shared with others, just like with a smartphone. Twenty-five years have passed since the EOS Kiss series was launched. Since then, there's been a change in the value people place on photos. KatoThe EOS Kiss M concept creation began by analyzing changes in users’ lifestyles, their involvement with photos and their sense of photos’ value. While the EOS Kiss series primarily targets family users including mothers, users today not only take pictures of their children, but also such everyday experiences as hobbies and time spent with friends. It is common for them to process these photos in their own way and casually share them among friends. Our project called for creating a camera with performance that accounted for such changes while delivering ease-of-use on par with that of smartphones. It was also important to achieve higher-quality images that could still be easily shared. Which features of the product were used to achieve this? The DIGIC 8 image processor made possible advancements in Dual Pixel CMOS AF* which include high-speed, high-precision focusing and continuous shooting up to approximately 7.4 frames/sec. max. with AF tracking and up to approximately 10 frames/sec with fixed AF. 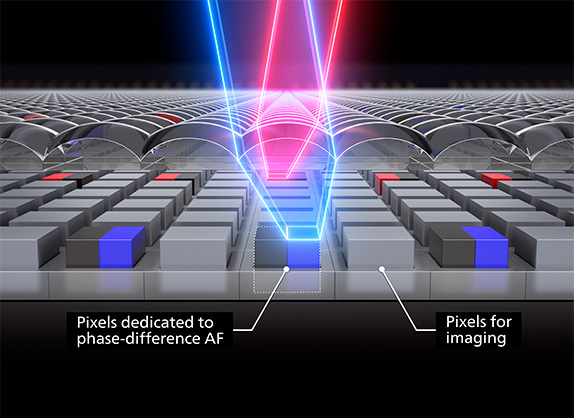 * Canon’s proprietary AF system which enables phase-detection AF on the CMOS imaging sensor’s surface. Thanks to the cutting-edge DIGIC 8 image processor and high-resolution CMOS sensor, the camera realizes higher image quality for still photography and 4K videography. Includes such features as “Creative Assist” that make it easy for users to create their ideal photos and “Silent Mode” that eliminates shutter sound. Functions that strengthen connectivity with smartphones and PCs, enabling automatic transmission of photographs and related data. Available in black or white, the camera features a compact, lightweight design that realizes superior portability. Was the use of the "Kiss" brand name decided from the planning stages? KatoAlthough the product’s official name was not yet determined when discussions for the product planning began, the shared assumption among the development teams was that the camera would be positioned within the EOS Kiss series in terms of target users and product concept. Although it was intended for the family demographic, it wasn't simply a matter of making it easy to shoot photos or minimizing the number of dials and buttons. Rather, we set out to design a camera that was easy for beginners to understand and handle while keeping them engaged as they developed their skills and embraced photography as a hobby. A single device that delivers functionality demanded by modern users, enabling them to capture their ideal image while retaining a compact, lightweight design at an affordable price--that's what it means to attach the "Kiss" brand name to a camera. Cutting-edge technologies and groundbreaking functionsand a new image processor redesigned from the ground up. Delivering new levels of simplicity and high performance. 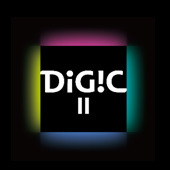 Involved in DIGIC hardware development since 2002. 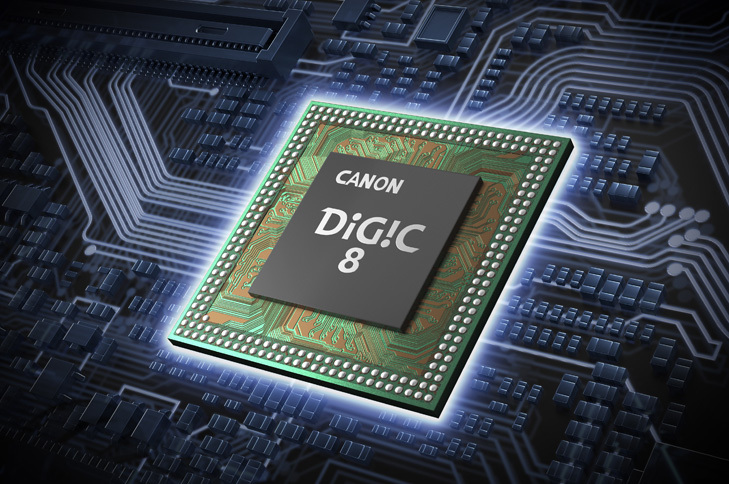 The EOS Kiss M was the first camera to use the new DIGIC 8 image processor, wasn't it? 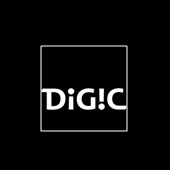 Yuichiro KimijimaEven from the initial stages of DIGIC 8 development, we were aware that it would be used in the next generation of mirrorless cameras. Therefore, I feel it was a given that this processor would be utilized in a camera bearing the "Kiss" brand. 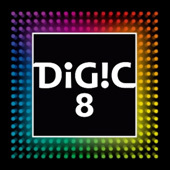 DIGIC 8 I have been involved in the development of the DIGIC image processor from the first generation in 2002. Equipped with nearly all of the basic functionality required of cameras, DIGIC is capable of generating and processing beautiful images at high speeds using visual data captured by the lens and image sensor. There are far too many to name here, but major functions include the processing of captured image input from the image sensor; processing of signals required to record data, arithmetic processing of evaluation values for AF--the centerpiece of the new DICGI--digital image stabilization and processing relating to mechanical control, display, communication and recording media. In addition, a significant amount of care has gone into designing high-speed processing architectures of such aspects as AF, video, display and of course, algorithm functionality. What's more, when we designed the DIGIC 8, we undertook thorough revision of basic functions including imaging and recording signal processing. Why did you undertake such improvements? KimijimaWhen it comes to DIGIC’s signal processing, functions are largely divided into: “image capture” to take in data coming from the sensor, and “recording” to record the captured data as high-quality images. 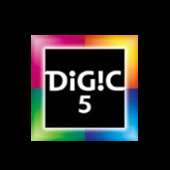 DIGIC 8 was designed to deliver enhanced basic processing performance in such aspects as continuous stills shooting and 4K videos capture. However, we couldn't allow any of those improvements to create additional cost in terms of price or power consumption. 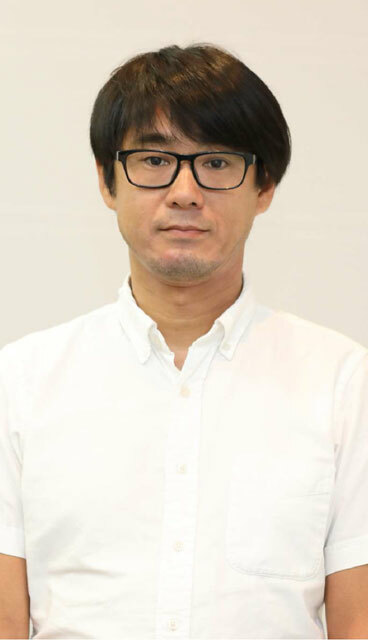 Therefore, it was essential that we review from scratch the existing standards for basic signal processing of image capture and data recording, in order to maintain these requirements at their current levels while still achieving enhanced image processing engine performance. That must have been a painstaking effort. KimijimaOf course, there were a lot of difficulties. But the efforts we devoted to reviewing the signal processing paid off in the form of such major improvements as reductions in cost and power consumption. There were also other challenges to overcome.. For example, extended 4K video capture proved difficult because of the significant amount of heat generated when processing such massive amounts of data. However, thanks to our overhaul of basic signal processing, we were successful in minimizing power consumption while enhancing image quality, even during 4K video capture. With earlier generations of DIGIC, we placed emphasis on stills shooting, but video performance has become increasingly important in recent years, and that means a much greater processing load. Still photography and video capture share some common functions in terms of signal processing, but they also demanded vastly different specifications from the camera. Recognizing this point, we went to great lengths to consolidate common functions while making efforts to optimize other distinct processing requirements. What were your main areas of focus when developing the EOS Kiss M? KimijimaI made it a priority to effectively communicate the functionality of the DIGIC 8 processor to our product development team. The processor boasts an incredible amount of features. In order for my colleagues to draw out the full performance of these features, I felt it was vital to sort through and accurately convey the significant amount of information available. 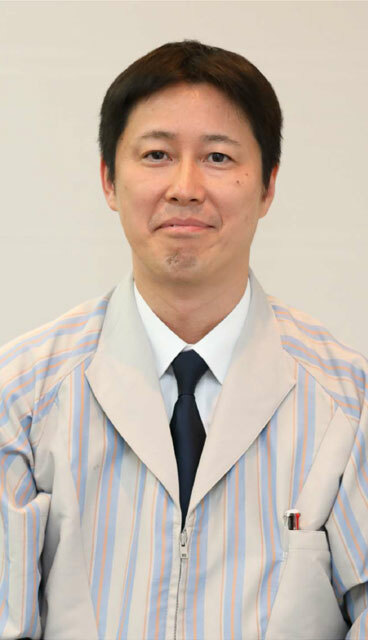 Atsuya KawanishiKeeping in mind the camera's target users, I prioritized ease of use when designing the AF system. I tried to make sure users could capture the kind of images they wanted to using the simplest possible settings and operations. In charge of AF firmware design. Since joining Canon, he has been involved in the development of digital video cameras, SLR cameras and compact digital cameras. Motto: Where there's a will, there's a way. 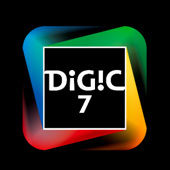 How has the DIGIC 8 processor advanced the technology behind Dual Pixel CMOS AF? KawanishiIn short, DPAF is Canon’s proprietary AF system which performs phase-detection autofocusing on the CMOS image sensor. Conventional Hybrid CMOS AF sensors were composed of seperate pixels for AF and imaging. 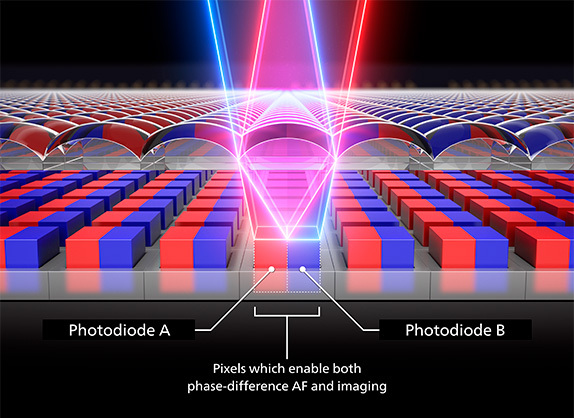 However, each pixel on a Dual Pixel CMOS AF sensor comprise two photodiodes. This makes possible simultaneous autofocus and image capture on every pixel. This feature has enabled both high image quality and AF performance, making it possible to focus quickly even when shooting in dark locations and other environments where it may be difficult to focus. It also allows users to maintain focus on a subject during continuous shooting of stills and capture smooth video footage. 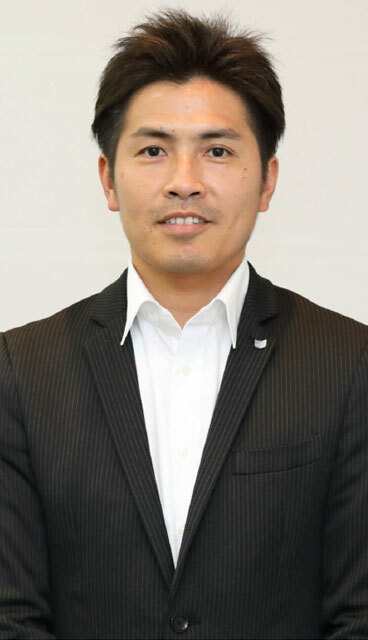 Canon was recently honored with the Prime Minister's Prize at the 2018 Ceremony of National Commendation for Invention, hosted by the Japan Institute of Invention and Innovation for “The development of an imaging sensor that realizes phase-difference autofocus on the imaging surface” (An invention related to Dual Pixel CMOS AF). 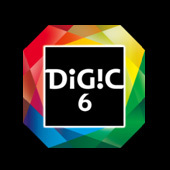 What other technological achievements have been made possible with DIGIC 8? KawanishiDIGIC 8 has greatly improved processing time, making it possible to perform a wide range of high-density processing. As a result, we've managed to achieve enhancements in basic AF performance--such as widening the AF area and pushing the limits of focusing in low light-?significantly increasing the range of possibilities for photography. What's more, the advanced performance of this image processor has also improved overall camera functionality. For example, we can now answer user demand for focusing on subjects' eyes with our “Eye Detection AF” function. We spent a lot of time and energy figuring out just how many of the features demanded by our target users we could include in this camera within the limits of development time and product cost. Eye Detection AF It also proved difficult to achieve the level of AF performance that's come to be expected of the Kiss series in a mirrorless camera body. We aimed to achieve AF performance comparable to that of DSLR phase-detect AF using such advantages unique to mirrorless as depth-of-field information across the entire viewfinder screen linked with subject tracking technology during live-view shooting. Thanks to our efforts, I believe we were able to achieve both ease of use and high levels of performance. SLR cameras employ an "optical viewfinder", which reflects the scene captured by the lens using a reflex mirror inside the camera body. This allows for shooting in real time so that users can capture images at the exact moment desired. As suggested by their name, mirrorless cameras do not utilize a reflex mirror. Instead, they convert the scene captured by the lens as visual information and display it in the camera's electronic viewfinder or LCD monitor. Advantages to this approach include the ability to check brightness levels and color hues. In charge of image processing design. Since joining Canon, he has worked on improving the EOS series' image quality with paritcular regard to video. Motto: "First things first, give it a try." 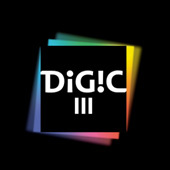 DIGIC 8 has led to even greater image quality. Which aspect did you work especially hard to improve? 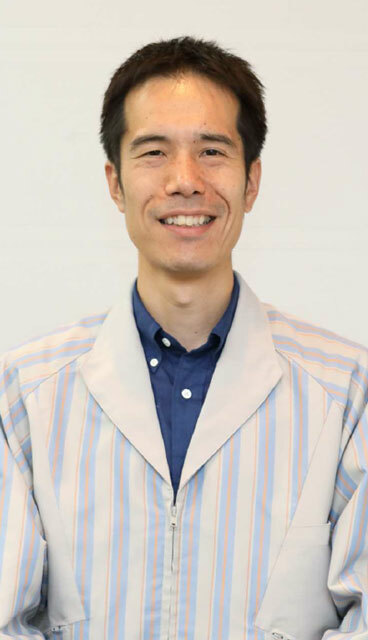 Takashi AkahaneI'd have to say it was designing the image processing system for video. Although the EOS Kiss M is designed primarily with entry-level photographers in mind, we also strove to deliver high-quality video that would also satisfy advanced users. The advancement of image processing technology was a major contributing factor in making 4K video the greatest feature of EOS Kiss M's most noteworthy feature. Until recently, conventional image processors have been designed with an emphasis on shooting still images. Particularly when it came to high resolution and controlling noise sensitivity, some circuitry that worked for stills wasn't suitable for video, or certain still photography functions weren't fully usable with video capture. However, thanks to a radical overhaul of signal processing with DIGIC 8 and a design that emphasized video, we've been able to minimize such limitations and push the limits of video image processing. How is the design of the image processor related to that of image processing functions? 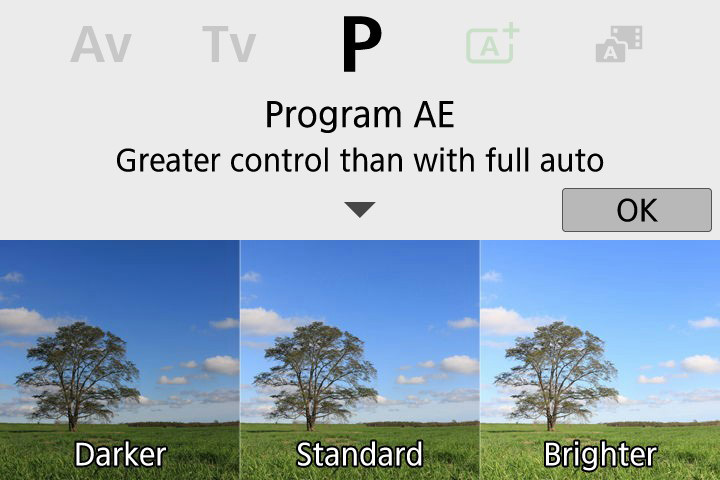 AkahaneMy job is to improve image quality through effective use and control of the processor's various functions. For example, the processor design team is responsible for developing a noise reduction function. Then it's up to me to design a way of utilizing that function. Suppose you're photographing someone in a dark environment. The amount of light that reaches the imaging sensor is quite low, resulting in a poor-quality image with so much signal noise that you may not be able to recognize the subject's face. Noise can be mitigated somewhat if your camera has a noise reduction function. However, although this helps remove noise from the image, if it's not utilized properly, you may you may also wind up removing data from vital portions of the image such as the subject's eyes. So in order to ensure that only noise is removed, we introduce parameters to control the boundary between noise and the subject. This time around, the processor underwent a drastic overhaul. That meant I also had to rethink how to manage image processing from square one, which made design work quite difficult. Thinking it over alone would lead me nowhere, so I frequently consulted with the engine design team. They kindly advised me on image processing for video from an engine design perspective. I evaluated 4K video shot on various other cameras and using the EOS Kiss M, I performed repeated trials in scenarios where I imagined users would want to shoot 4K video. Based on this input, I was able to apply my own judgement and figure out exactly how to modify current parameters. KimijimaVideo is where we see the greatest benefits of the processor's reduced power consumption. The camera doesn't generate too much heat, even when shooting for extended period. On top of that, image quality is never compromised. Achieving all of this was definitely the most challenging part of the work I performed with the image processing team. It can be said that inter-department cooperation is one of Canon's greatest strengths. KimijimaI think so. Even if performance requirements for the processor were increased, it simply wasn't possible to lengthen the development period or bring in more people. In these kinds of situations, it becomes even more important that we have an open and agile organization in which, for example, the AF and image processing teams can work more closely together. This kind of organization helps boost productivity and performance in important but less apparent areas. I'd like to continue this way of doing things and strive to achieve even greater teamwork and collaboration. Having worked on inkjet printers, scanners and home-use fax machines in the past, he now chiefly handles design projects related to camera products. The EOS Kiss M has a really classic camera look. Can you tell me about the design concept for this product? 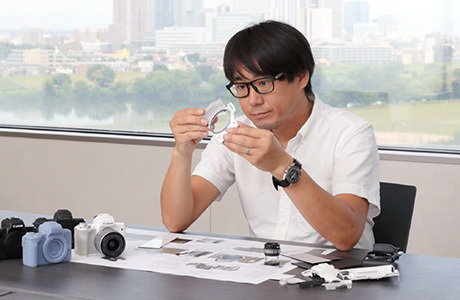 Yasushi MatsumotoOur key aim for the EOS Kiss M design was to create a standard mirrorless camera. In other words, the concept I pursued was sticking to camera fundamentals without compromising usability, despite it being a camera that you can casually carry with you. This resulted in a simple, iconic camera shape with the viewfinder placed above the optical axis of the lens. In addition to the viewfinder, LCD monitor, hot shoe* and tripod hole are all arranged on the lens optical axis in line with camera fundamentals. Placing the viewfinder and tripod hole in the center is usually considered counterproductive when it comes to reducing the size of a camera. However, as a camera manufacturer we were acutely aware of how these factors come into play when looking through the viewfinder or setting up a tripod for greater stability. The grip design looks easy to hold, even for women with smaller hands, doesn’t it? spoon-cut form MatsumotoNot only is the Kiss M compatible with the EF-M series of dedicated lenses for EOS M series cameras, through the use of a mount adapter, the camera also has access to the extensive lineup of EF lenses, which range from super-wide-angle to super-telephoto. For that reason we were very particular about achieving superlative grip, taking into consideration how mounting various lenses would affect users of different hand sizes. 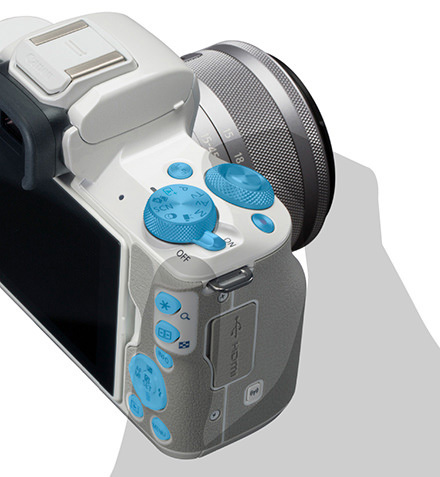 What’s more, sticking to principles of EOS design, we ensured the camera had shutter button where the user’s finger would fit naturally as well as a “spoon-cut” form. We wanted to make sure the parts of the camera that the user typically holds were comfortable, so we embellished the grip with a leather-effect texture finish. We also extended the same finish to the rear surface of the LCD monitor to co-ordinate the monitor with the grip when it has been closed. The arrangement of dials and buttons concentrated on the right side of the camera body When it comes to photographing small children for example, users may feel like taking pictures while holding their baby or while pushing a baby carriage. In order to capture these coveted photo opportunities, it's important that you can shoot at a moment’s notice with one hand. To that end, we concentrated dials and buttons on the right side of the camera body so that the user can turn the camera on and off as well as access change exposure settings with one hand. All these features reflect our commitment to offering a camera that is easy for any user to handle, from entry-level users to professionals using Kiss M as sub-camera. Compactness is one thing, but on the other hand, buttons can be more comfortable to use when they’re somewhat larger. How did you find a balance? Button shapes MatsumotoWe verified grip performance by making dozens of prototypes using a 3D printer; testing how it would feel when putting your thumb on the dials or buttons, how much dials should protrude from the body, what angles would be best to turn dials, and what button sizes would be best. Assuming that the front-side electronic dial would be turned with the index finger and the rear-side mode dial with the thumb, I came up with easy-to-turn designs by making the dials a trapezoidal shape slightly tapered upward rather than a cylindrical shape. What was your thinking behind developing different colored models? Kiss M color variations MatsumotoBlack is a standard color, so that was going to be one of the available colors from the start. With female users in mind we then chose glossy white, which is rare for this sort of camera, as a color variant. As consumers became more familiar with the product, this white version gained popularity to the extent that more than half of user buying the Kiss M opted for white. In spite of my initial expectation that the white version would be liked mainly by female users, I found that a considerable number of male users were choosing it, which I didn’t expect. Was designing this camera a team effort? What kind of steps did you have to go through to bring the product to completion? MatsumotoAt the start, several designers came up with their own ideas that we then had to narrow down to the most suitable. Since my idea was adopted for this particular project, from that point on I would engage in most of the processes alone. I had repeated discussions with the Product Planning, Product Development, Production and other divisions and thoroughly examined the feasibility of the design idea from the standpoints of overall camera design and cost performance. There were of course a lot of elements that couldn’t be realized but, while standing by some vitally important points that I couldn’t compromise on, I worked with the related divisions to come up with a shared vision of the design we wanted to achieve. 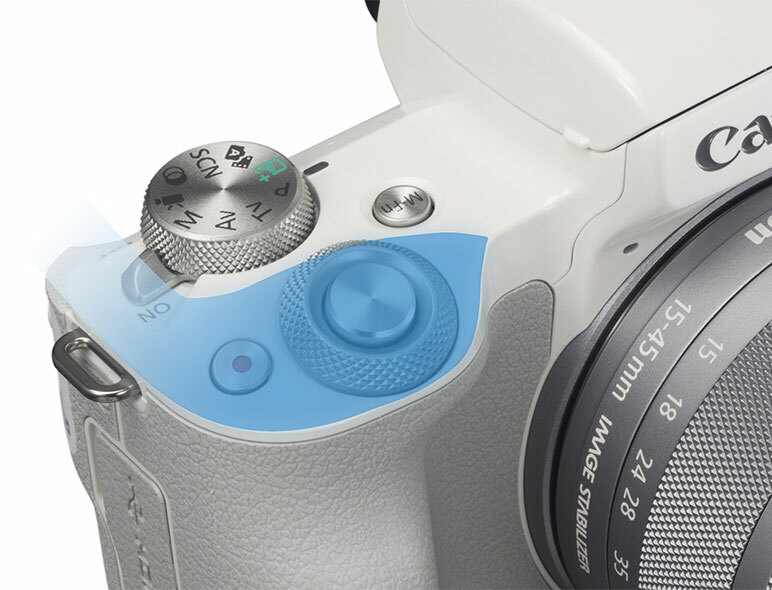 The flat rear surface The vari-angle monitor, the first of its kind to be featured in an EOS M-series camera, was designed to fit inside the camera body without protruding when it’s closed. Making a recess in the camera body to fit the LCD monitor inside was an unexpectedly tough job. However, our strong desire to harmonize the hinge and the LCD monitor with the camera body by minimizing protrusions led to success, which wouldn’t have been possible without the cooperation of various related divisions. Now I can proudly say that we have realized a truly good design by clearing all these challenges without compromising on quality. KatoIn addition to the EOS Kiss M’s core concept of being compact, lightweight and easy to use, delivering the product at a reasonable price was also important. Working together with the various design and development divisions involved, we made sure to achieve our target cost. That said, we weren’t looking to make a “cheap” model, the final product had to be something that users would want to own. So, we discussed it over and over again and finalized the design after examining many proposed ideas. Since joining Canon, she has been working as a user interface (UI) designer in charge of designing camera UIs and related application software. She is mainly engaged in developing graphics for entry-level user-oriented products. What elements of the UI did you attach importance to? Asami NakamuraIn the past, cameras were mainly used for capturing such events as school sports days. As times have changed, cameras have become an everyday item that people increasingly carry in their bags for casual use. As such, I wanted to include features in the camera that would open the eyes of users to the fun of creative photographic expression, even those users who would typically stick to using auto mode. MatsumotoThe EOS Kiss M has a lot of functions that allow anyone who knows about exposure to easily create images as desired. 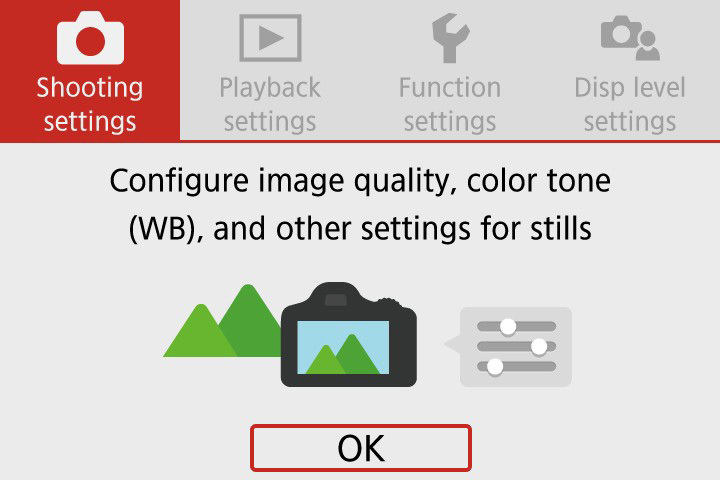 However, these useful functions mean next to nothing for users who continue taking pictures using auto mode only. To that end, I thought if such image-creating tools and buttons were a part of Auto mode, then many entry-level users would be likely to experiment with them. We wanted users to give it a try and realize they too can manipulate those image capture settings, without worrying about numerical values, just as they would with a smartphone. NakamuraWhile the Creative Assist function icons are colorful overall, each one has a distinct shape for easy identification, even in conditions that make the LCD screen hard to see, like shooting outdoors. I went through design after design while testing for ease of use, comfort and visibility. Are there any other innovations you introduced to lower the hurdles for beginners? NakamuraFor first-time users of an interchangeable-lens camera, Kiss models feature an auto mode. This is the beginner’s gateway to their camera, so it’s of the utmost importance that this function isn’t in any way intimidating. With that in mind, I included a large, conspicuous reset button for users to return to the default auto mode settings if they got confused while changing settings with Creative Assist. I conducted user tests again and again before finalizing the reset button and deciding that the design we settled on was best. What about innovations for users who are looking to step up their photographic techniques? NakamuraIn order to encourage users to try their hand at such modes as Shutter Speed Priority and Aperture Priority, I devised a system in which the effects of each mode are graphically displayed as a photo illustration as you turn the mode dial. This is a function for those users who wish to take a step forward from total dependence on Auto mode. 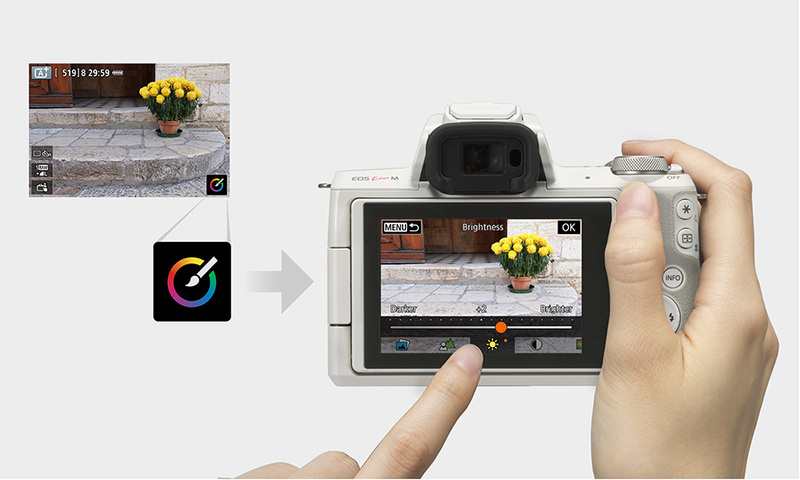 Provides easy guidance in the selection of shooting modes while giving an example of a photo taken with each mode. Displays items that can be set at the top of the menu screen in a concise way. Can you tell me about your UI workflow? 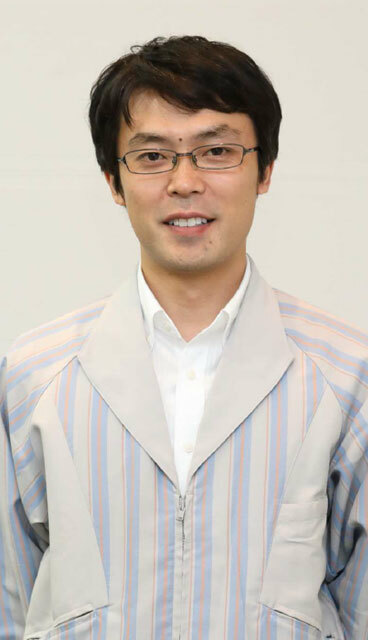 NakamuraWe established the UI concept based on the results of various studies and the goal of the product itself. Then in order to visualize the design I thought about what kind of structures would be needed and working closely with the Product Development Division decided on such details as button size. User tests conducted throughout the development process were also important. During one test we received a comment, “When moving a gauge using the Creative Assist, I couldn’t clearly see the object I wanted to shoot.” To deal with this problem, I changed the mechanism to make unrelated icons disappear from the screen. I believe repeated user tests and improvements are the key to successful product development. Lastly, let me ask each of you a little bit about the elements of your work you think are most important as well as what motivates you. To start, what is the most important part of planning a product? KatoOne important element of product planning is communication. You have to communicate your thoughts and feelings, which will become a part of the product, in an easy-to-understand manner to the development division as well as distributors and eventually to end users. What circumstances led to the commercialization of this product? What is our primary aim and what types of people are our target users? What values do our customers have relative to cameras? I think it is important to only start thinking of product concepts and features after taking all these questions into consideration. What was it like developing the image processor? 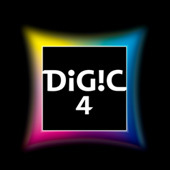 KimijimaThough DIGIC image processors themselves are very small semiconductor chips, we think it is extremely important for everyone involved in its development to be aware that developing this chip touches on the development of every part of the overall camera. Take a developer in charge of noise reduction, for example. If that person carries out their job thinking only about the design specifications of the noise reduction circuit, then the camera could end up optimized for a specific function and in the end may fail to satisfy the requirements for the camera’s overall specifications. While a good noise reduction circuit is very important for achieving high ISO sensitivity, that is not the sole aim of a camera’s still-image processing and could compromise various other factors that are intricately intertwined with each other. It is therefore essential that developers have a good grasp of processing aspects overall, starting with sensor input, the acquisition of AF evaluation values, image display output and through to the final generation of recorded images. Merely achieving the targeted ISO sensitivity is not enough if continuous shooting speed drops due to noise-reduction performance. So, the key point is whether we can develop superb DIGIC functionality from such well-rounded approach. So you're saying even if you're only developing a small part of it you have to know the ins and outs of the project overall? KimijimaAt Canon, rather than outsource chips, we develop the image processor in-house from scratch. What’s more, professionals who understand cameras inside and out are assigned to develop these image processors, allowing them to create a processor with specifications that add real value to a camera. This is one of Canon’s great strengths, I think. KawanishiThe same is true of development of the AF system. Even within this single function there are now a myriad of sub functions, so related technologies and divisions are also diverging. And so it’s important that we keep in contact with each other while working on something so we know what to prioritize and always keep the overall balance of the camera in mind. What is something you have to bear in mind when designing a system that can process 4K video? AkahaneWith the resolution of 4K video images approaching that of still images, it’s expected that users will start using frames extracted from video as still images. Accordingly, a certain level of knowledge and know-how about still images is required when setting image quality goals and examining methods of image evaluation for 4K video. On the other hand, we also have to clear requirements peculiar to video images, such as maintaining exposure and white balance levels to achieve a smooth connection between frames. If the resolution of 4K videos continues to improve at this rate, before long we will see virtually no difference between the use of still and video images. As designers, we will also have to get rid of such barriers from our consciousness. What do you find most satisfying about design work? NakamuraIn the development process, it’s often the case that you tackle each problem as they come. But with design, you could be making small changes to the shape of a button or repeatedly revising some minor detail when all of sudden it all comes together in an instant. It’s those eureka moments that bring me the most satisfaction. MatsumotoOur development process begins with initial sketching, then we move on to mock-up making. As the product contents and design are gradually decided on, prototyping follows before the product finally takes concrete form. At times, this can be a painstaking process, but everyone joining forces as one toward a shared goal gives us all a true sense of satisfaction. I feel a particular sense of achievement when our design takes shape as a finished product and is launched with favorable market reception. I feel a certain sense of pride when I come across our product at a shopfront, almost like parent. Seeing our product being actually used is another exciting moment, so much so that I almost feel like saying hello to the user. These are rewarding occasions that make me especially happy as a designer. The EOS Kiss M is often advertised on TV and other media, which also makes me quite happy. 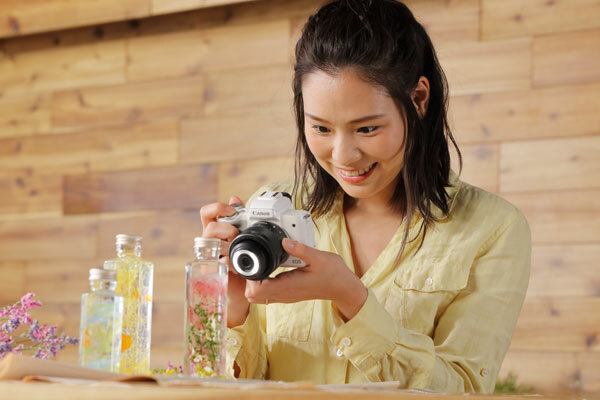 Although the EOS Kiss series targets entry-level users with its beginner-friendly features, the appeal of EOS Kiss M is not limited to user-friendliness. 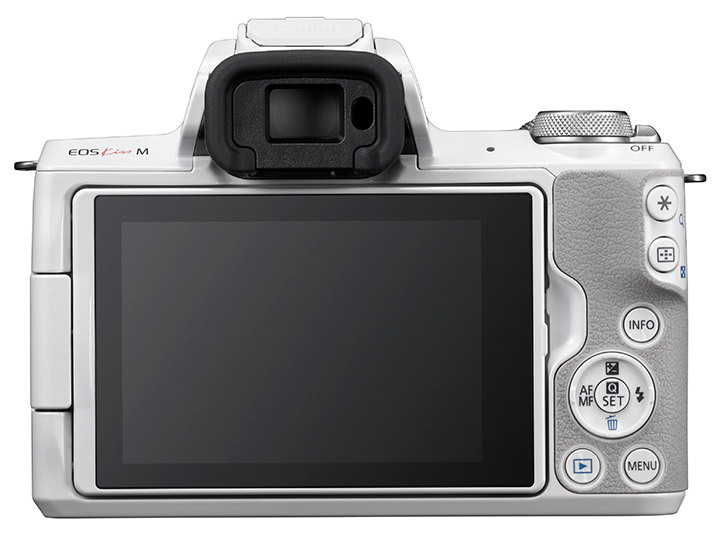 Rather, its diverse functions and high-level performance make it stand out as a camera. From the initial stages of development, everyone involved shared the same enthusiasm of creating a camera that would allow even beginners to appreciate a level of high image quality that was once reserved for SLR cameras and superb performance made possible with the latest technologies. To realize this goal, these developers faced tough challenges again and again, making adjustments and improvements until to the very last moment. The EOS Kiss M has made a timely debut when mirrorless cameras are coming to the fore, winning increasing favor with photo lovers. It will surely bring the joy of using an interchangeable-lens camera to all users?regardless of age, gender or lifestyle. Please help us improve our content. We will use it when creating future content. 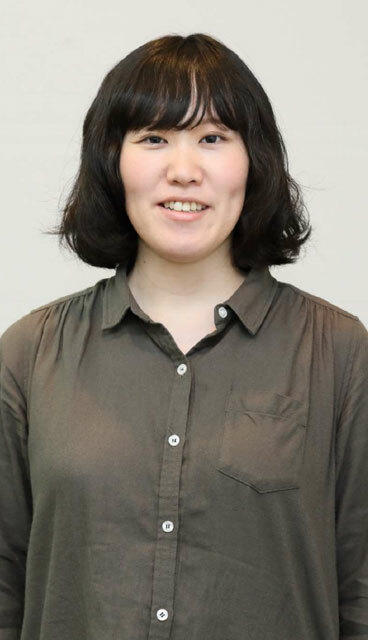 Interviewer/text writer: Yoriko Goto Ms. Goto became an independent freelance writer after having worked with a printing company and an editing company. As an industrial writer, she is now active in a wide range of industrial fields, including semiconductors, energy, industrial equipment and environmental issues. Reproducing the world in true-to-life images! Creating lenses that help photographers pursue their passion. Ultra High-Resolution CT SystemAquilion Precision?